Using six different projection systems, one website projects the Rays to finish 82-80. In 2006 and 2007 we called this “The Mathematical Definition of ‘No Chance In Hell'”. In 2008? It is now more like the “The Mathematical Definition of “Getting Warmer”. 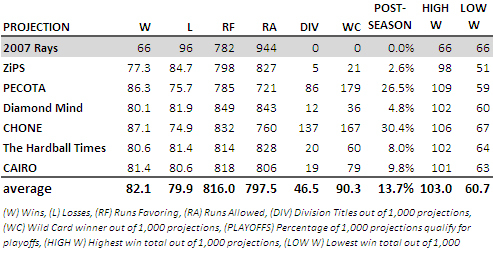 The good folks over at Replacement Level Yankees Weblog have finished their annual mathematical projections of the 2008 season. In short they run 1000 simulations for the 2008 season using player projections from six different sources including Dan Szymborski’s ZiPS, Baseball Prospectus’s PECOTA, Diamond Mind, Sean Smith’s CHONE system, The Hardball Times and their own CAIRO. Last season only the first four projections were used and when combined, the Rays were projected to win 71 games and made the playoffs 45 out 4000 seasons or about 1.1% of the time. In reality, the Rays lost 148 games and made the playoffs 0% of the time. For more details on the individual projection systems and their level of historical accuracy, go HERE. We previously mentioned that single iterations of the 2008 season using PECOTA and CHONE projection systems gave the Rays 88 and 89 wins respectively. At the time we tried to temper the excitement because they were only a single piece of data. We now see that both systems have slightly lower numbers when projected over 1,000 seasons. These projections are based on a healthy Scott Kazmir. Even the most conservative projection for the pitching staff (Diamond Mind) has the Rays allowing 100 fewer runs in 2008 while PECOTA has them bettering their ERA by over a run a game. The average projections look a little like what I think most Rays fans would expect. A .500 record and about a 1 in 6 chance of making the playoffs if things break the right way. This is cool. I'd still like to keep something along these lines on the Cork Board to track the accuracy of the various projections over the course of the year.